Middlemarch gets my vote for the best English language novel ever written, and possibly my favorite as well. It comes down to Middlemarch vs Pride and Prejudice and I can never choose. 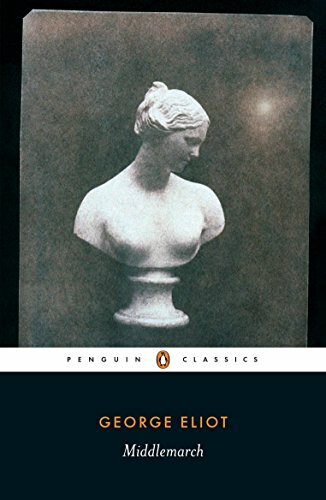 Middlemarch is longer and more challenging than Pride and Prejudice, so I haven’t read it as many times, but although not openly satirical or as sharp-tongued as Austen, Eliot shares both Austen’s wit and her deep and nuanced understanding of the foibles of human nature. At the same time, Eliot’s novel is much further-reaching than Austen’s. Middlemarch is subtitled “A Study of Provincial Life” and unlike Austen, who confines her pen largely to provincial gentry and their romantic and financial entanglements, Eliot lays out the whole life of a small English town in the 1830s, from gentry to vagrants and everyone in between. The psychological realism she achieved is remarkable, especially considering the field of psychology barely existed at the time the book was published, and despite the very different world her characters inhabit, you will recognize them as well as if they were your next-door neighbors (indeed, it’s quite possible that some of them are), and grow to care deeply about them.